Local Christmas Events for the 2016 season! Looking for some fun Christmas activities for your family this Christmas season? Here are a few things going on in our area! Griffin Christmas Parade – Downtown Griffin- Saturday, December 3rd 6:00 p.m. The Rock Ranch Breakfast with Santa – December 10 9:30 a.m. The Rock Ranch Country Christmas Nights – Open dates include Dec. 9, 10, 16, 17, and 19 from 5:30 p.m. to 9:30 p.m. Lighting of Concord – December 2 5 p.m.
Rock Springs Church “Our Coming Savior” – December 10, 6 p.m. – December 11 2:30 p.m. and 6:00 p.m.
Truett’s Grill – Griffin Pictures with Santa – December 1 6-8 p.m.
A small shoebox can have a big impact……. the world through Operation Christmas Child. We are a pick up and drop off location for Operation Christmas Child! You can pick up a box from our office, fill it for the children and return it to us. Please join us in filling shoebox gifts. Boxes will need to be picked up and returned to our office by November 13th! What goes into the box is fun, but what comes out of it is eternal. Be a part of changing children’s lives all over the world in Jesus’ Name through the power of a simple gift with Operation Christmas Child. Many of you know how Toys for Tots works, but for those of you who don’t, let me explain. “Campaigns begin in October and last until December 22nd. Caring Americans (such as yourself) drop off new and unwrapped toys at receptacles located in local businesses (such as ourselves.) Coordinators pick up, sort, and store these toys in a warehouse. As Christmas nears, Marines distribute the toys, with the help of local social welfare agencies and churches, to needy children on Christmas Day. Marine Corps Reserve Toys For Tots Pamphlet. Visit www.toysfortots.org for more information. The McLeRoy Realty family wishes you and your family a wonderful and safe Christmas seasons! 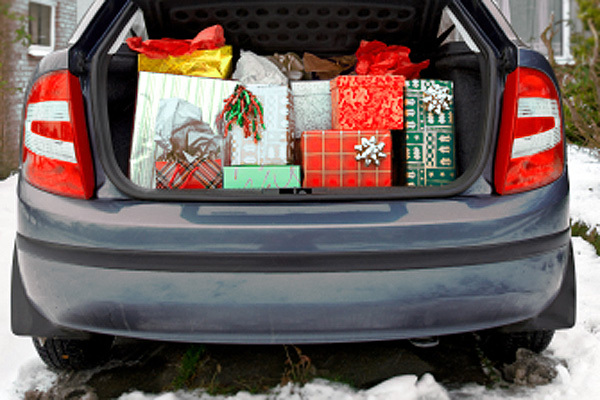 If your children snoop for presents, consider hiding gifts in the trunk of your car — kids will never think to look there. 1. Borrow a friend’s house. Swap storage spaces with a trusted friend or neighbor, and you won’t spoil any surprises. This is particularly useful if you’re buying someone a big present, like a bicycle or a car — you might talk a neighbor into letting you borrow space in their garage until Christmas morning. 2. Pop the trunk. This won’t work if you have an SUV or hatchback, but if you’ve got a car with a trunk that’s closed off from the backseat, it’s a primo place to hide gifts. Small children will never get in there. 3. Make your office work for you. If your office is a safe, secure place, squirrel some presents there. This is only an option if you work out of your home, though — home offices are prime targets for prying eyes. 4. Take stock of kitchen pots. Got a huge stock pot? Unless you’re planning to make a giant vat of soup anytime soon, the stock pot can hold a load of small gifts, and chances are your family will never think to look there. 6. Crack the crawl space. If you don’t mind a little dirt and some creepy-crawlies, the crawl space can hold some sizable presents. Don’t store anything there for too long, though — unless your crawl space is insulated. Moisture and temperature changes could damage items. Plastic toys are OK to keep outside; electronics should be stored inside. 7. Rent a storage space. If you’ve got a ton of presents to hide, you’ll need to look outside your house. Some storage units offer one-month-minimum specials for as low as $25. Check the storage units in your area for deals. 8. Go for the cleaning supply closet. Worst-case scenario: Your kids might find presents there, but they’d also find the cleaning supplies, which means they might actually clean something. Now that would be a Christmas miracle. Where do you hide holiday presents? Please continue to support our efforts with Toys For Tots. Today is the last day to drop off new, unwrapped toys at our offices at 8945 Highway 19 N in Zebulon. Thank you for your support! During the holiday season, it is so easy to get stressed. Be sure to take a few moments each day to do something nice for yourself. Below are some ideas of what you can do. Know your lights. If you’re buying new lights, make sure they’re compatible with your existing light strings. Unsure how many lights you need for your tree? Figure 100 to 150 lights per vertical foot of the tree. Use LED holiday lights on your tree. LED holiday lights use up to 80% less energy and are cooler than traditional incandescent lights. Add movement. Want that snowflake display to sparkle or your eight tiny reindeer to trot? Give the illusion of movement with color changing lights. Many options are available, including twinkling, chasing, and fade-in, fade-out styles. Check into cascading icicles with a circuit that gives off a melting effect. Mix lighting styles. To make holiday lighting stand out, pair strings of different sized lights together to add depth to decor. On the tree, set a base of white lights at the bottom and continue upward, adding strands of large bulbs and novelty lights for color and variety. Find inspiration. Every year, thousands of tree lighting ceremonies take place all over the country. Draw ideas from these magical designs. Are you looking for something fun to do this weekend? Griffin will be hosting their annual Christmas parade Saturday, December 1st. The parade will be at 6pm and make its way down Taylor St. Come out and kick out off the Christmas season! Yesterday, we posted an article about designing an amazing Christmas light display. But how old is too old for Christmas lights? Many of us still use traditional incandescent Christmas lights. Christmas lights that are typically more than 5 years old run a higher fire hazard risk as well as take more energy to run. Consider switching to a more energy-efficient, cooler-burning alternative, like LED. LED lights cost a little more up front over traditional incandescent, but you will save money on the electricity it takes to run them and you will have peace of mind that your tree will not catch fire. Some of the big box hardware stores offered a buy back program at the beginning of the Christmas season. If you brought in your old incandescent Christmas lights, they would give you a credit towards the purchase of new LED lights. Check with your local stores to see if you may be able to benefit from such a buy back program.